Nowadays firms can live or die by the quality of their reputation. With social media, customers can instantly spread your praises or make you appear like an incompetent demon. It certainly helps to know what others are saying about you on social media so you can react appropriately, taking damage control if need be. 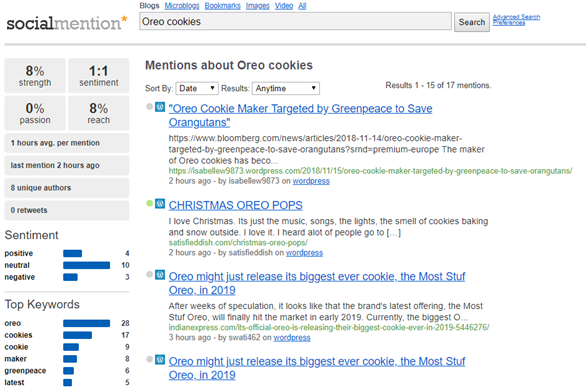 A while back, we profiled 10 Tools to Monitor Brand Mentions. 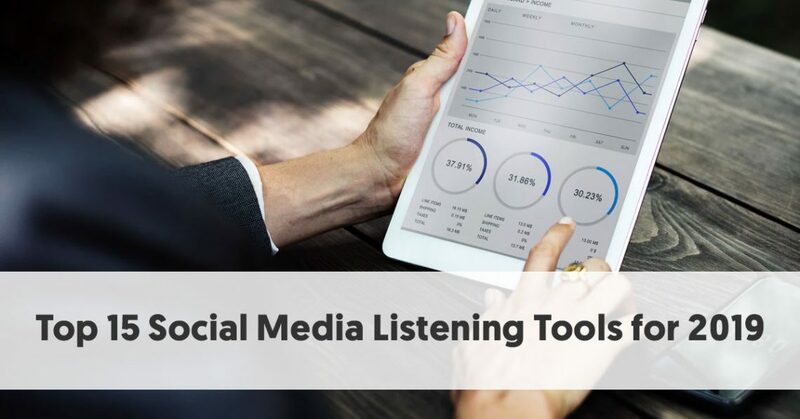 We take another look at the industry here, looking at 15 social media listening tools for 2019. We have deliberately picked products that we (mainly) did not look at in our last article. Many of these tools target large businesses and enterprises and do not advertise prices for their services. However, you should find a suitable tool to help you discover your social media mentions, no matter what your size or level of competition. Plans: Not shown on website. Contact Brandwatch for information. Brandwatch helps you discover vital insights within the billions of conversations happening online every day. It helps you know your customers. You can use it to reveal key consumer insights, drive product innovation, and stay ahead of the competition. There is also a version of the product developed for agencies, Brandwatch for Agencies, which combines their social intelligence technologies with agency-specific training, support, and resources to help agencies win new business and retain clients. Brandwatch currently crawls 95,635,729 websites for mentions of your company name or other terms relevant to you. Plans: New Business $49/month, Growing Business $79/month, Company $299/month. 14-day free trial. 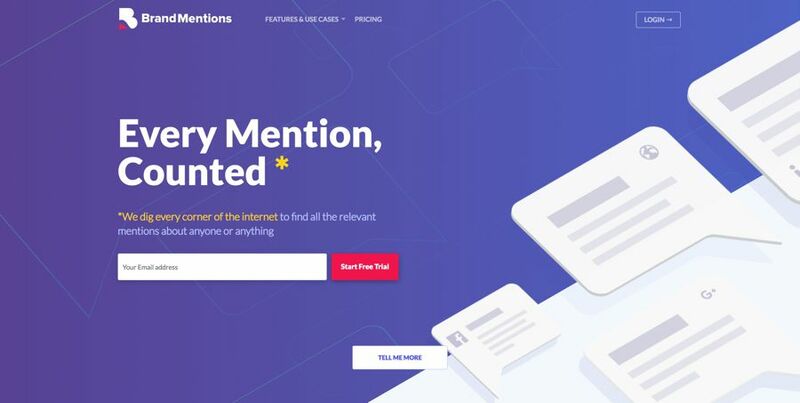 BrandMentions searches virtually every section of the internet to find all relevant mentions about any of their clients (or any other term that interests them). Brands can use it to monitor everything that is being said about their company or product on all the channels that matter, be it web or social media. BrandMentions cover all the essential channels where people talk about brands. It also offers comprehensive sentiment analysis, finding out the tone of the conversations. You can also use BrandMentions to spy on your competitors. You can use it to reveal your competitors’ marketing strategies. Indeed, you can quickly research and gain insights on any brand or any topic from any market. It provides you with real-time notifications with email alerts and link notifications. Plans: Not shown on website. Contact Meltwater for information. Meltwater provides AI-driven insights, covering many aspects of an enterprise’s activities. A significant aspect of this is its social media monitoring and engagement software, emphasizing analytics and focused engagement. It looks at more than just social media, examining millions of posts each day from social media platforms, blogs, and news sites. It filters out irrelevant mentions and assigns sentiment to the mentions that interest you. You can use Meltwater to set up searches, find key influencers, and track your online performance. Meltwater incudes multiple dashboards, including some that monitor, benchmark, and analyze your online activity. You can also design customized dashboards to meet your needs better. Meltwater allows you three keyword per search, and you can add numerous filters to refine the results. It carries out sentiment analysis on the results, determining whether each mention is positive, negative, or neutral. Plans: NetBase Starter, NetBase Business, NetBase Enterprise. Prices not shown on website. Contact NetBase for information. NetBase provides real-time insight into customer conversations. It uses AI to determine emotions, behaviors, attributes, hashtags, people, and brands from social posts. NetBase’s platform processes millions of social media posts daily. It also uses non-social data, for example, surveys, focus groups, ratings, and reviews, to discover as much as possible about a business. You can use NetBase to capture all the conversations about your business, across 99+ countries and 199 languages. It even includes analysis of the latest emoji and language. You can use it to compare the performance of owned, earned, and partnered content. You can also use NetBase’s AI to discover when your brand appears in pictures. This can help you find out the most popular user-generated content relating to your brand on visual platforms, such as Instagram. At the same time, you can use it to see if anybody has misused your logo. Forrester recently named NetBase, a leader in their social listening platforms report. Plans: Plus $49/month, Premium $99/month, Max $399/month. 14-day free trial. Brand24 provides you with social insights into what people say online about your brand. Unlike some of its competitors, Brand24 targets businesses of all sizes, with a $49/month package for small or new businesses. It shows you a mentions feed, where you can discover what people say about your brand and take action in real time. You can join in and engage in discussions directly from Brand24. It shows you a Discussion Volume Chart, graphically depicting your brand’s mentions, so you can easily see any surges in brand mentions, and discover if there is a problem. Indeed, it provides full mention analytics, giving you a better understanding of who is talking about your brand online. Brand24 has developed their own Influencer Score, to help pinpoint your industry influencers, so you can begin making contact with the people that matter in your niche. It also includes sentiment analysis – not only can you see mentions of your brand, but it gives an indication of whether these mentions were positive, negative, or neutral in tone. Plans: Not shown on website. Contact Digimind for customized pricing. Digimind Social describes its services as being AI-powered social media listening. It provides real-time software to assist brands to listen, engage, analyze, and report. It shows you the social conversations about your brand, splitting them into categories, and giving each mention a sentiment rating of positive, negative, or neutral. You can also use it to measure the performance of your content, by analyzing and benchmarking the performance of an unlimited number of social accounts. You can install the Digimind App for Hootsuite to integrate your Digimind streams into Hootsuite. This means that you can manage all of your social activity together, joining into conversations that mention your brand. Digimind Social also allows you to see your brand image based on Google search behavior. You can follow in real-time what your customers want to know about your brands, products, people, and those of your competitors. Overall, Digimind Social provides a broad range of monitoring, analyzing, and engagement features. Plans: Not shown on website. Contact Synthesio for information. 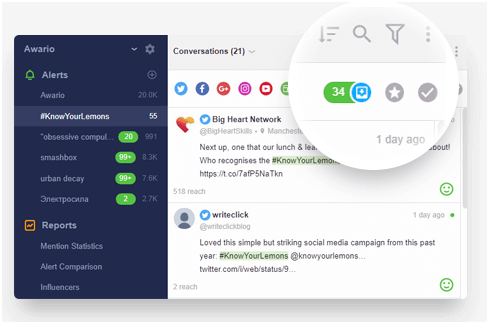 Synthesio Social Media Intelligence Suite is a social listening platform that monitors businesses’ online presence and provides their clients with actionable insights. It currently captures social media intelligence from 195 countries in more than 80 languages. It offers automatic sentiment analysis (AS) on more than 20 of those languages. It features customizable Social Listening dashboards, displaying an immense amount of data relating to social mentions of your brand. All mentions in the Synthesio Social Listening Platform incorporate robust metadata about the content, author, and tone. They can be filtered easily. You can also integrate into these dashboards paywall data from LexisNexis, logo recognition capabilities, and consumer reviews. You can also track views, likes, favorites, replies, retweets, and shares from Facebook, Twitter, Instagram, and YouTube directly on your social media listening dashboards. You can add high-level business intelligence with Media Value and Engagement Rate widgets. Synthesio enables you to export massive pre-filtered data sets via API or using an in-house tool, Reveal, and merge Social Listening metrics with performance data in many SaaS business intelligence tools. Cyfe provides an all-in-one business dashboard showing social media, web analytics, marketing, sales, support, infrastructure, and more. You can pull data from popular services like Google, Salesforce, Xero, QuickBooks, and many more services using pre-built widgets. Alternatively, you can build your own widgets if you wish to work with a product not yet supported. Cyfe includes dashboards relating to Start-up (data about new sign-ups, app downloads, subscriptions, and other related KPIs), Social Media, Marketing, Client, Web Analysis, Finance, Sales, and Project Management. Clearly, Cyfe covers much more than just social mentions. However, it does incorporate social listening capabilities. It is also much cheaper than many of the more specialist products mentioned here. Regarding the Social Media Dashboard, Cyfe uses real-time data and metrics to start tracking how your brand or clients are doing across Facebook, Instagram, Twitter, YouTube, Google+, Pinterest, YouTube, LinkedIn, and Vimeo. Plans: Professional $99/month, Team $199/month, Corporate $499/month, Agency $699/month, Enterprise – custom pricing. Discounts for annual payment. 7-day free trial. Keyhole provides some online monitoring solutions. All plans include hashtag and keyword trackers, account trackers, and influencer trackers, but the quantity of each differ depending on the tier. Higher plans add in additional features, such as advanced sentiment analysis (at Corporate and higher), media wall and moderation (and influencer management (at Agency and higher) and more advanced analytics (on the Enterprise plan). The heart of Keyhole is social media analytics and reporting for an account. You can monitor all accounts and posts in real time, and use Keyhole’s analytics to help you optimize your posting schedule. 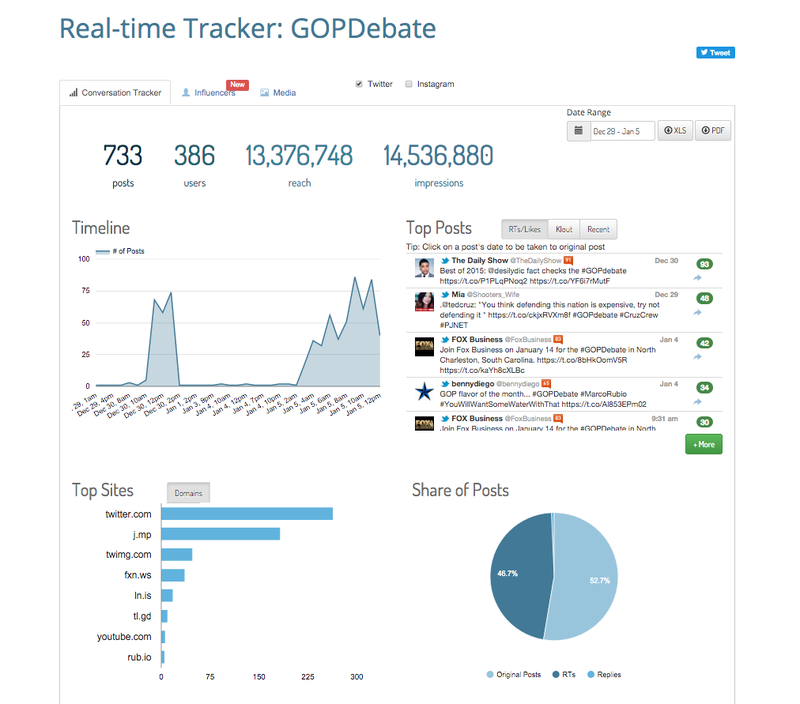 You can also monitor hashtags and keywords in real-time. You can use this to assist with social listening. You can use Keyhole’s data to optimize and report on your hashtag campaigns. You can discover the total number of posts, the engagement rate, and the total reach and impressions your hashtags have generated. Plans: Solo $29/month, Starter $99/month, Company – custom pricing. Discounts for annual payment. Free trial. You can use Mention to scour the web, social media, and more for powerful market insights. The Solo plan is designed for a solo user to monitor their brand. The Starter Plan targets small businesses to monitor their brand and competitors. It is at this level that you have a dashboard, have access to sentiment analysis, and can access an Influencer’s Dashboard. It is with the Company Plan, that you gain access to many of Mention’s features, however. This is designed for companies who wish to grow their brand and business, as well as agencies. The Company Plan gives access to additional features, such as Facebook crawling, historical data, a Twitter dashboard, and more. Mention helps you monitor the web, social media, forums, and blogs to learn more about your brand and your industry. You can quickly analyze public opinion with sentiment analysis for all mentions. Customize your alerts and filter by source, language, & date. You can refine your alert by adding or deleting keywords. Plans: Starter $29/month, Pro $89/month, Enterprise $299/month. Discounts for annual payment. Free trial. Awario finds Instant mentions from all around the Web and social media. It crawls over 13 billion web pages daily, in addition to APIs. You can use Awario to find all mentions of your business or organization’s Twitter, Facebook, Google+, YouTube, Instagram, blogs, forums, news sites, or indeed any publicly accessible webpage. The Starter Plan is designed for Individuals and small businesses monitoring their brand. Even at this level, you can set three mention alerts, one leads alert, and receive up to 30,000 new mentions per month. An alert is a keyword or set of keywords that Awario will monitor for you. A mention is a result that it finds. The Pro Plan is best for small and medium-sized businesses monitoring their brand, industry, and competitors. With this plan, you can set 15 mention alerts and three leads alerts. It will find up to 150,000 new mentions per month. The numbers grow further with the Enterprise Plan, targeted at more prominent brands monitoring multiple products and competitors. This level permits 50 mention alerts and 10 leads alerts. Awario finds up to 500,000 new mentions per month. You can track the growth in the number of your mentions and their collective reach, sort mentions by positive, negative, and neutral with sentiment analysis, identify top influencers by social network, compare several alerts, and analyze progress with Awario's analytics. Plans: Single Location $29-$49/month, Multi-Location $10-$49/month/location, Agencies $10-$49/month/location. Free trial. You can use Reputology to monitor, respond to, and analyze all of your online reviews from one place. It offers 24/7 review monitoring of over 100 review sites, including Google My Business,, Facebook and local search directories, employee review sites, app directories, and more. You can track reviews written about your locations, products, and services. You can respond to reviews from within the Reputology platform. It includes semantic analysis technology that converts the unstructured content from reviews & feedback into actionable data. Review Monitoring – the software provides an aerial view of your online company reputation. Collect more reviews – ReviewInc helps you to create a customized review marketing campaign that engages customers to give feedback about your business on the review sites like Google Maps, Facebook Reviews, and other review sites. Amplify customer feedback – the system takes your great reviews and broadcasts it to the world. You amplify positive reviews with testimonials on your website, share them on social media with a single click, or even automate the process entirely with free Zapier and Hootsuite apps. Plans: Not shown on website. Contact 76Insights for information. Businesses can use 76Insights to provide them with insight into which articles, posts, and social objects are most successful and resonate with people. You can use the app to view posts in a graph or in a card view layout, filter posts, and share the most resonant content with your social networks and more. The app enables you to identify the outliers that drive reaction on social media. It gives you resonance score breakdowns by social network. You can see your content performance with intuitive visualizations and group social accounts into handy watch lists. Plans: Not shown on website. Contact Sprinklr for information. A central part of the suite is social listening. It listens to 3 Billion consumers across 350 Million sources – including 26 social channels. It allows you to see the volume, context, and sentiment of online conversations – both historical and real-time – and use that information to make strategic decisions that support business goals. It includes endlessly drillable dashboards and surfaces real-time insights that connect to your unique business KPIs. You can also monitor competitive and industry activity to benchmark successes and decode competitors’ strategy.